Dwele is a different kind of soul. Straight out of Detroit, he began as an emcee but soon changed his style into singing soul music. While many popular rappers change their style and become singers, Dwele gained his popularity after he changed his style to singing. He independently released his debut solo album 'The Rize'. He sold it out of his trunk and sold out the first week. The album soon was bootlegged and burned by thousands of people. Eventually, it traveled all over the world. People began to take notice on his hush, whispering vocal style. 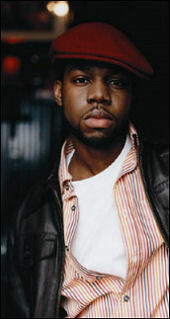 Dwele earned worldwide recognition for the unique and soulful vocals on the Slum Village song 'Tainted'. The melody and his voice stuck in listener's heads. Now, Dwele finally released his proper solo album 'Subject' on Virgin Records. Songs like "Find A Way", "A.N.G.E.L." featuring Slum Village, "Lady At Mahogany", and "Kick Out Of You" are all powerful, fun, and emotional. Critics have hailed Dwele as one of the leaders of the 'Nu-Soul' or 'Neo-Soul' movement. He has become one of the most respected new soul artists today and one of Detroit's greatest exports. On a hot summer night in August 2003, I had an in-depth conversation with Dwele about Detroit, the label of 'Neo-Soul', women, Slum Village, instruments, the future of soul music and much more. With a cool flow and a hush vocal style, Dwele enlightens us with his unique approach to soul music. MVRemix: Your new album is called 'Subject'. Tell us about it? Who is on it? Who produced it? Dwele: I have production by G-1 out of L.A. Ron Estill out of Detroit. I worked with DJ Jazzy Jeff's Touch Of Jazz on a song. I worked with Raphael Saadiq and Jack And The Phatman. Also, Mann who is also out of L.A. The rest of the album is pretty much produced by myself. MVRemix: Can you explain the title 'Subject'? Dwele: I called the album 'Subject' because I look at the album as my work of art, like the way a sculptor or a sketch artist would look at his work. In order to work, he needs a subject. In this case, my subject is women. In order to come to work, you have to study everything about the subject, what makes the subject what it is. In saying that, I had a lot of fun with this album. MVRemix: Do you have a favorite song on 'Subject? Dwele: I have a lot of favorites but if I had to choose a favorite, it would probably be 'The Truth'. MVRemix: How old were you when you first got into singing and how did you get into it? Dwele: I first started singing seriously when I was about 19 or 20. I actually started off rapping. I would make tapes. People would listen to the songs and say, 'I like that song' or 'I like this song'. They would always gravitate more towards the vocal songs, the one with singing. I thought to myself, 'I may have something here with these vocals'. I thought that I should try singing. I put out an album called 'The Rize' album. I sold 100 copies. It sold out in one week. If I had known that it would have sold that quickly, I would have made more. It got bootlegged and made its way across the globe to London, Amsterdam, China and back to Detroit again. MVRemix: Are you ever going to rap on any of your songs again? Dwele: Yeah! Most definitely! I feel rap. I still rap to this day but it just didn't come out on this album. On the 'Subject' album, I didn't really want to put too many different elements on the album. It would confuse people and the label and then, the label wouldn't know how to market it. The 1st album is pretty much kept to singing. MVRemix: How did you get the name Dwele? Dwele: My full name is Andwele. It's a Swahili name. When my mother was pregnant, she was reading through a book with African names and every time she would say the name 'Andwele', I would start kicking. MVRemix: In one phrase or sentence, how would you describe growing up in Detroit? Dwele: A lot of ups and a lot of downs, like anywhere else. MVRemix: What was one of the first songs that made you fall in love with music and inspired you to become a musician? Dwele: Wow! Good question. Stevie Wonder's 'Contusions'. MVRemix: As a singer and a producer, who are some of your major influences? Dwele: Without a doubt, Stevie Wonder and Donnie Hathaway on vocals. Stevie Wonder especially on production. Roy Ayers. I grew up on a lot of Miles Davis and Freddy Hubbard. I grew up on a lot of jazz musicians. Dwele: I usually make the music first and let the music dictate what I write. That is most of the time. Sometimes, I do come in with pre-written lyrics or melodies and I build around that. MVRemix: How did you hook up with Slum Village? Dwele: I actually connected with Slum Village in 1996-7. I was playing in this club called Caf� Mahogany. They would come down every Sunday and freestyle. At the time, I was rapping so that was like our common ground. That's how we got to know each other. We started rapping. We just grew from there. MVRemix: Is Jay Dee back in Slum Village? Dwele: I'm not sure. I know that Jay Dee did do a couple of songs on their new album. He's rapping on a couple of songs as well. MVRemix: What is going to happen to Elzhi? Dwele: Nah, nah. Elzhi is still doing his thing. MVRemix: What do you do to preserve you voice? Dwele: I do me� everyday. I really don't do anything. I drink water. Dwele: I'd like to collaborate with a lot of artists. Billal, Jill Scott, The Neptunes. I want to collaborate with everybody. MVRemix: You are considered both an R&B and a hip-hop artist. You have worked on both types of songs too. How is making a hip-hop song different from making an R&B song? Dwele: Yeah, I think it's different in a way that making a hip-hop song is really more about the groove than about the lyric. When you're making an R&B song or a slow song, it's about the lyrics too but it's mainly about the music. You have changes in the music. It's just a lot more musical. You have to put in a lot more musically. Dwele: I have to say that last week, we were in Belgium. We were at a hotel and we walked into a restaurant. The guy didn't want to give us any menus. He said that they were closed but people were coming in and sitting down at the same time. I think that it may also have something to do with the fact that we are Americans. MVRemix: Where were you on Sept. 11th, 2001? How did you deal with it? How do you think it has affected or will affect the music industry? Dwele: On September 11th, I was on an airplane on my way to L.A. Thank God the plane never left the ground. We got on before the incident happened. We were actually on the plane when it happened. The Captain came over the air and said that there wasn't any aviation in the U.S. He couldn't give us any details but we knew something about a plane crash. He said that we could use our cell-phones while we taxi to the gate. It was chaotic because one person turned their cell phone and actually got through to somebody. They told the person that a plane hit the World Trade Center. Everybody's first reaction was 'Wow! That's horrible!'. Then, the guy told us that a plane hit the Pentagon. At that point, we all thought 'Oh my God! We're at war!' Everyone looked at the person next to them. It got real crazy on the plane. It really affected music a lot. It affected the whole industry. A lot of people were scared to leave their city, to get on planes, to continue traveling. It seemed like the record labels were scared to spend money. They didn't want to throw money out there because they may not get it back. I think that it put a halt on everything. Dwele: Blond hair and a t-shirt. Dwele: Soul at its best. Dwele: Ah, don't do that to me. MVRemix: What classic song would you like to remake? Dwele: If I could remake a classic, it would be 'This Christmas' by Donnie Hathaway. Dwele: Right now, when people see me, they think I'm a rapper. I'm not really a rapper anymore. MVRemix: Many people have labeled you as part of the 'neo-soul' or 'nu-soul' movement. How do you feel about that? Dwele: I take it as a compliment, the fact that they compare me to those cats. As far as the label goes, I don't want to be labeled something. I would rather just call my music 'soul' music. MVRemix: When you go on tour, do you have a full band with you? Dwele: Yeah, we have a drummer, a guitar player, a bass player, a keyboard player too. MVRemix: Detroit has blown up as a center for music creativity. Back in the day, you had Motown and even other forms of music but it took a long time for hip-hop/R&B. Why do you think this took so long? Dwele: I just think that it was Detroit's time. Electronic music played a big part in Detroit blowing up and actually putting Detroit in the forefront of music again. The music of Detroit brings people from all over the world to Detroit. I really just think that it's our time now. I really do. MVRemix: Your singing style is not brash and loud. It is lush with a whispering quality to it. Was this a style that you thought out or was it something that just happened naturally? Dwele: It just happened that way. It's just the way I sing. Dwele: That's a good question! I really don't know how to answer that. I really don't think that I have made too many mistakes because my album is out right now and I'm happy. I think everything happens for a reason. MVRemix: Can you explain the song 'Lady At Mahogany'? Dwele: That song was based on a story, a little something that happened back in the day at this place called Caf� Mahogany. Caf� Mahogany was this place where you could see live bands and hear poetry. It was a real cool-out and relaxing atmosphere. It was just one incident that went down. It's somewhat of a true story but I elaborated on it a little bit. I made it a little bit more dramatic. MVRemix: What is next in the future for Dwele? Dwele: Who knows. Right now, just a lot of touring, fun, and a lot of seeing the world. As far as albums go, I don't know how I may feel in the future. I might go more towards production or I may become a rapper. Who knows? I might put out a trumpet album. MVRemix: What other instruments do you play? Dwele: I play piano, trumpet, a little bit of bass, a little bit of guitar. MVRemix: Do you have a favorite instrument? Dwele: My favorite would probably be keyboard. If I only had one instrument, it would be a keyboard. Technology, at this point, nowadays, every single instrument sound is on a keyboard. MVRemix: What kind of keyboard or organ were you playing in the Slum Village 'Tainted' video? Dwele: I have no idea what kind of keyboard that was! I think it was an organ. It was dope! I wish that I could bring that back with me. I loved that thing. Dwele: My favorite part of my live show is when I interact with the crowd. You never know what's going to happen. You never know what somebody is going to scream out. MVRemix: Who are you going on tour with? Dwele: Right now, it's just me and the band. In late September, I'm supposed to be going on tour with Slum Village again. MVRemix: What's the next single off of the 'Subject' album? Dwele: The next single after 'Find A Way'� I'm not sure but I'm almost positive that it will be 'Money Don't Mean A Thing'. MVRemix: How is the album 'Subject' doing? Dwele: Pretty good considering I don't have a video out for it. MVRemix: Are you going to make a video for the album? Dwele: Yeah, we're actually going to shoot the video next week for 'Find A Way'. Then, we will do one for 'Money Don't Mean A Thing'. Dwele: If you don't have the album 'Subject', go get it! Don't bootleg it, don't burn it. That was alright with the 'Rize' album but I need the sound scans on this one. Go check it out and I hope you'll enjoy it. "My full name is Andwele. It's a Swahili name. When my mother was pregnant, she was reading through a book with African names and every time she would say the name 'Andwele', I would start kicking."